Cumulative sales of plug-in electric vehicles (PEVs), including battery electric vehicles and plug-in hybrid electric vehicles, reached 1.2 million worldwide in 2015. Still, PEVs account for less than 1% of vehicles in use globally. Future developments in battery technology, policy, and consumer preference have important implications for future PEV adoption and serve as a great source of uncertainty in meeting future mobility demand. An Issues in Focus analysis conducted for EIA’s most recent International Energy Outlook (IEO2017) considers some of these uncertainties through different PEV penetration scenarios and considers the effect that differing rates of adoption have on worldwide energy consumption. EIA developed two IEO2017 side cases to determine the effect on worldwide energy use if PEV adoption were higher or lower than projected in the Reference case. The Low PEV Penetration case reflects low consumer acceptance of PEV technology and projects a little less than half of the PEV stock as in the Reference case by 2040. The High PEV Penetration case reflects high consumer acceptance of PEV technology and projects almost double the PEV stock as in the Reference case by 2040. Different levels of projected PEV penetration have noticeable effects on worldwide liquids fuel consumption. Liquids fuel consumption in the light-duty vehicle (LDV) sector is almost two quadrillion British thermal units (Btu) higher in 2040 in the IEO2017 Low PEV Penetration case than in the Reference case. The High PEV Penetration case projects liquids fuel consumption to be 2.75 quadrillion Btu lower than in the Reference case in 2040. Projected changes in light-duty vehicle electricity consumption is not one-to-one with the changes in light-duty vehicle petroleum fuel consumption. Higher adoption of PEVs results in less petroleum use, both because of the greater efficiency of the PEV powertrain and the switch from using petroleum to electricity. In the Low PEV Penetration case, LDVs consume almost one quadrillion Btu less electricity than in the Reference case. 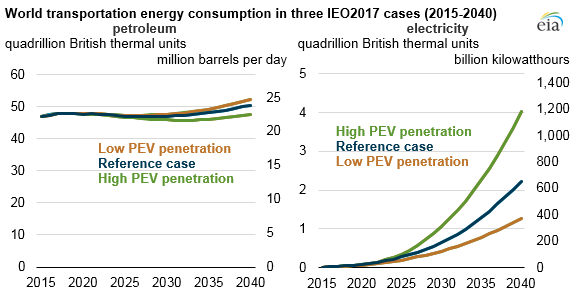 In the High PEV Penetration case LDVs consume 1.8 quadrillion Btu more electricity than in the Reference case in 2040. More information on electric vehicles is available in EIA’s International Energy Outlook 2017.